Why Do Dogs Curl into a Ball when they Sleep? How many times have you watched your dog take a nap or cozy up in their bed for the night in an odd position? Do they lay stretched out on the floor, with their paws up in the air, or curl up in a tight ball? 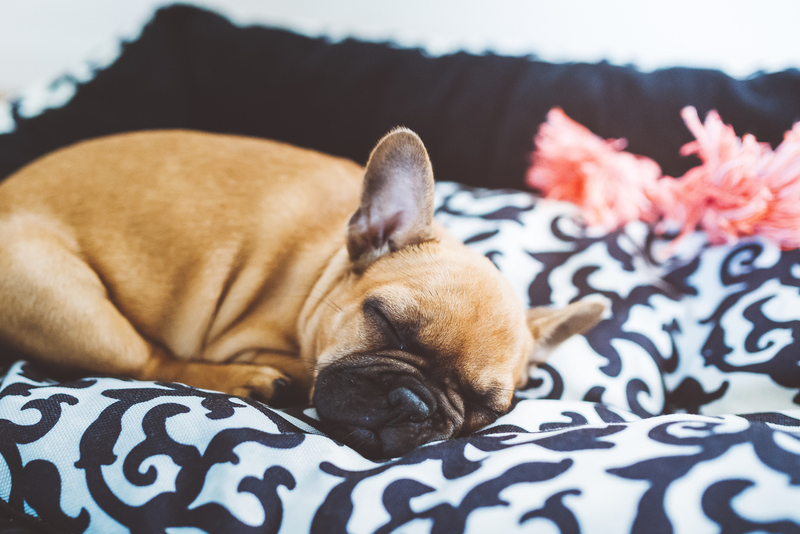 Advantek Pet lists the reasons why your pup could be curling up when they snooze to help you better understand these unusual positions. Believe it or not, what may look uncomfortable to humans can be incredibly comfortable to our pets. It is not uncommon for dogs to curl up into a ball, but not all dogs favor this position. Some enjoy sleeping on their backs or sprawled out. There are also several contributing factors that will influence your pet’s sleeping position. For instance, if they are in a new or unfamiliar territory, then they will curl up to feel cozy and safe. 2. They are trying to keep warm. One of the best ways dogs can stay warm on cold nights is by curling up into a ball. As a ball of fur, they can create a lot of warmth for themselves. Some dogs put their tail over their nose for more warmth and others sleep in tighter balls depending on comfort and size of the animal. 3. It makes them feel safe and secure. As mentioned earlier, dogs will curl up if they are in unfamiliar territory. This makes them feel more secure because they are in a position to protect themselves when they sleep. When you first get a puppy, it is crucial to give them enough space to get used to their surroundings and become familiar with their new environment. Sleeping in a ball will only make them feel more comfortable as they get accustomed to their new home. 4. It is a natural instinct. If a dog were in the wild, then they would curl into a ball to keep themselves warm and protected. They are also protecting their organs from potential harm because when an animal is asleep, they are vulnerable to predators. In a curled-up ball, dogs are able to protect their organs and try to prevent harm to their bodies. Does your dog sleep in any unique positions? Make them feel even more comfortable in a portable PET GAZEBO®. Set it up inside, in your backyard, or anywhere on-the-go to give your pet the luxury and comfort they deserve. Your pet has room to eat their food, get hydrated, relax, and play in their exercise pen. They can curl up with their favorite blankets and toys to relax indoors or get some fresh air while you can keep your eye on them. Are you interested in ordering a PET GAZEBO® for your pet to keep them feeling safe and cozy? Visit petgazebo.com to purchase yours today. Looking for the next best pet product to sell in your store? Learn more about selling our products by contacting Advantek Pet to get started.